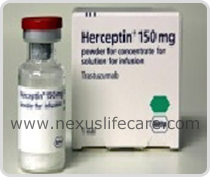 Uses:- Hereceptin Injection is a biological cancer treatment. Hereceptin Injection is a monoclonal antibody that attaches to the HER2 protein found on the cells of some breast cancers. Cancers that are HER2 positive tend to have a worse outlook than cancers that are HER2 negative. Side Effects:- Hereceptin Injection is a biological cancer treatment. It is a monoclonal antibody that attaches to the HER2 protein found on the cells of some breast cancers. Cancers that are HER2 positive tend to have a worse outlook than cancers that are HER2 negative.